I mean, Gary only destroys an entire softball team after they say that he and buddy Sugar Ray Leonard are gay for each other! So parents can feel good about the positive message this film teaches about tolerance: don’t call tough guys queers! Because they won’t tolerate it! It isn’t just homophobia that the smooth chested and ripped Gary combats in this film either. While he’s at home, stripped to the waist, working out, and glistening with hunk dew, he hears the smoke alarm in his apartment building going off! The unsupervised neighbor kids are at it again, this time trying to cook a frozen pizza without taking it out of the box! 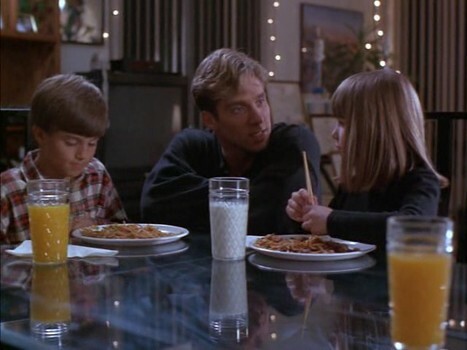 He saves the kids, gets the smoke under control and has them over to his place for some good old fashioned Chinese food! He ever teaches the little turds how to use chopsticks! Thankfully though, the city is burning (well at least the same city block the movie shows us again and again when it’s not using stock footage of the L.A. riots) and civil disorder is everywhere before Gary manages to turn this movie into an Afterschool Special on fire safety and good nutrition. The kids though provide us with valuable plot points as they interrogate Gary about what his job is. He’s in America training American soldiers, presumably in the deadly kickboxing techniques that won him the Light Heavyweight Title and left him undefeated! Just think how great all those bar fights between marines and navy guys are going to be when they’re all proficient with kickboxing! 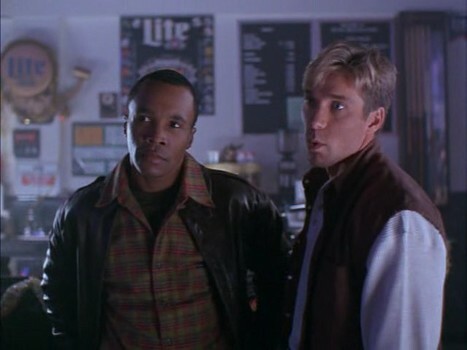 Following Gary and Sugar Ray’s night out at the pool hall, the military comes by and takes the duo to the British Embassy. Some of you may be wondering what Sugar Ray Leonard is doing in this movie. He plays a major in the army who is Gary’s best friend. He’s also the helicopter pilot in charge of flying Gary in and out of Gary’s suicide mission that he picks up at the British Embassy. In short, he plays the part that Fred “The Hammer” Willimson would usually play if this movie were made by Italians. Of course, I don’t remember Fred falling to his death from a skyscraper, but there is a freaking riot going on! Gary’s impossible mission where he’ll be outnumbered 30-1 is to go and rescue the ambassador’s daughter, Anna Lisa, who’s been kidnapped by a gang banger named Shyboy! The area she’s being held at is a no man’s land inhabited only by gang members, looters, and terrified shopkeepers! Gary has less than 3 hours to deliver the $2 million ransom to Shyboy and he has to do so by himself! Oh, and there’s just one more thing – the gal he has to rescue is his ex-fiancee! Whom he still loves! If the city thinks it’s seen a riot so far, just wait and see what happens when Gary goes after the potty-mouth animals holding his old lady hostage! Though the city has only been rioting for a couple of hours, it’s already turned into a post-apocalyptic wasteland! The first problem Gary encounters is a gang dressed up in street hockey gear! This makes for a good first workout since there’s all these hockey sticks for Gary to whack people with. These idiots are also on rollerblades which allows for lots of flying leaps, tripping, and flipping onto the ground. You might be thinking, “what sort of morons hear about riots and decide to get all dressed up for roller hockey to harass fellow citizens? Would that really happen?” That’s just how tenuous our hold on civilization is! We’re just a good riot or two away from a world depicted in films such as The New Barbarians and 1990: The Bronx Warriors! Think about that the next time you’re about to vote for liberals and against law and order! Gary manages to free Anna Lisa from the clutches of Shyboy though he does get her friend killed. To be fair to Gary, he didn’t know her and his impossible suicide mission wasn’t to rescue some broad he didn’t care about. I was a little concerned though since Gary managed to accomplish this pretty early in the movie, but when Shyboy starting firing a rocket launcher at them and blasted their escape helicopter out of the sky, I breathed a little easier. So Gary goes and gets revenge against Shyboy by having a final, no holds barred street fight with him, right? Wrong! 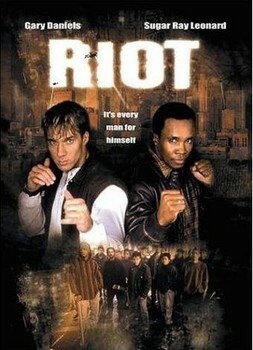 This isn’t just some action movie, this is based on actual riots! Remember the stock footage? As you’ve probably already guessed, the Irish Republican Army shows up and kills Shyboy, takes the money and goes after Gary and Anna Lisa! It turns out the IRA was just using the riot as a cover to kidnap the British ambassador’s daughter to use her as a bargaining chip in whatever dispute they have with the British government! Keep that crap on your side of the pond, you ignorant blokes! No one over here cares about any of that IRA stuff! We couldn’t even be bothered to go see Harrison Ford and Brad Pitt in The Devil’s Own! Riot realizes all this and once Bryan O’Flaherty’s motivation is briefly mentioned it’s all about unrelenting violence! Gary’s attacked by a bunch of motorcycle riders and one guy even gets set on fire and still comes after Gary before crashing into a couple of cars and exploding! And you better believe that causes Gary to run straight at the camera and get blown off his feet in slow motion! Gary also manages to find a junkyard in the middle of Los Angeles to fight a bunch of these punks in! Guys are slammed into car doors, Gary pops out from under the hood of a car to kill people, and Anna Lisa is wounded! Next stop is the parking garage where Gary and O’Flaherty engage in a deadly game of demolition derby that ends spectacularly with Gary diving out of his car as it plummets off the parking garage and swinging from rope high above the ground as all kinds of stuff, including O’Flaherty, blows up below! Once the movie gets going after Gary gets done kickboxing that burnt up pizza, he cuts a very impressive swath of destruction through things! Sure, all the action seems to take place on the same city block, the softball team consists of about a fifty guys who never seem to get hurt, and the IRA goons number in the millions, but come on! Gary is getting run over by cars, pursued by construction equipment, having a shoot out in a church, and dropping Sugar Ray to his death 50 stories to the ground! What Gary and director Joseph Merhi (Rage, Zero Tolerance, Executive Target) understand is that an action movie should have action! You don’t need a significant budget to set stunt men on fire and throw them through plate glass windows! You just need a kickboxing champ to make it happen!